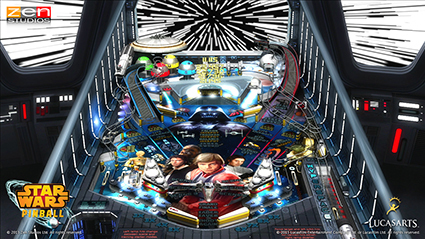 Star Wars Pinball Review: The Force is Strong With This One - Reclusive Fox ""
Zen Studios and Lucas Arts unite to bring fans the massive universe of Star Wars to the wonderful world of pinball with… Star Wars Pinball. 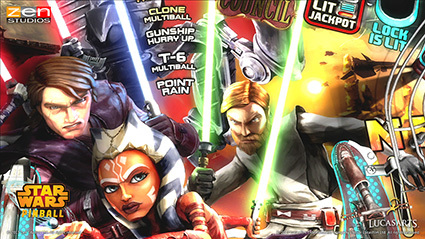 A 3 table pack featuring Episode V: The Empire Strikes Back, The Clone Wars and Boba Fett. I’ll go right ahead and say that this is the most visually amazing table of the pack. The playfield artwork is beyond amazing and accurately portrayed cast from the original movies is worth minutes of viewing itself before even pulling the plunger. Ramps and lanes feel smooth from both left to right. You’re only concern is the mid play field where you’ll find the ball can be spat right back at you with ferocious velocity. 5 flippers come as standard with two flippers near the top that are almost parallel to the main flippers. The 5th however is tucked away on the right and is unusually used compared to most tables. Zen’s creativity sure shows on that part. Missions are fun, especially if you’re the ultimate Star Wars fanatic. You can play up to 6 scenes from the Empire Strikes Back with interesting scenarios based on the original George Lucas film. Skillshot is a simple one that doesn’t require precision and plunger strength but more timing. Each of the 3 balls increases the speed of the raising and the lowering of the spinner. Hit it dead on with maximum power and you’ll earn multiple 100, 000 bangers in an instant to set you off. The sound effects alone will send any Star Wars enthusiast into geek overload, not to mention the dot matrix featuring snippets of the actual movie and even the video mode for training Skywalker plays an interesting and fun part of this table that’s never been seen in any other. Immediately we are greeted with the scrolling credits made famous in the Star Wars saga. Yet again Zen have taken great detail to the play area display or artwork. A mass of lightsabers fills the tables with colour and trademark value. This table by far has the most impressive ramps and lanes in any table I’ve played. It becomes addictive to simply conjure up big scores via combos and almost becomes second nature where rhythm takes a hold of you. Even the Council missions play a huge part on aiming for the ramps which requires you to catch the ball with the flippers, resulting in great satisfaction and rewarding accomplishments. The General Illumination itself guides you along the lanes into a combo frenzy. A well placed skillshot will reward an immediate 500, 000 and land within the bumpers that will possibly grant you an increase in the multiplier before you’ve even used the flippers. A great table for scoring big even on your first ball. Training mode will see you a big fat achievement/Trophy but getting to it is a difficult task. It’s incredible once you enter the next playfield. One of my favourite features about this table that scores you big. Not only do you enter one playfield but multiple playfields once you have progressed providing you don’t lose the ball. Some awesome fun to be had with that especially if you’re an achievement hunter. The bounty hunter Boba Fett appears with his very own table. It’s the least dazzling with illuminations but has that gritty sand planet feel to it which has Star Wars DNA all over. Saying that though this has become my least favourite of the 3. There always happens to be a particular table that never really grabs my full attention and I think once you’ve played Clone Wars and The Empire Strikes Back it’s hard to follow up with Boba Fett on a rhythmic endurance quite like the other tables. There just no pleasing everyone and it brings respect to those at Zen that they’ve created such variety with all 3 tables. The skillshot awkwardly alters each ball but nothing too hard to obtain. The ramps and lanes really don’t offer a great deal of fluidity quite like the other tables but that’s where the fun is. It’s a gawky table to get used to. An unusual flipper is placed on the left side that can result in an instant outlane fail if you don’t time it at all correctly but it’s a flipper that is required in the awesome respect missions. 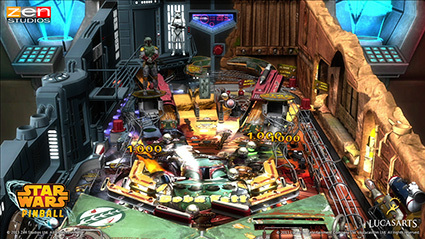 Seeing Star Wars Pinball work and play so well yet so differently to previous tables is an awesome feat for Zen Studios. Once known for bringing original designs to Pinball machines that could never be imagined in real life, using heroes and villains from the Marvel universe couldn’t possibly get anymore awesome until now. Seeing the character animations take place on screen with prime examples such as disabling the AT-AT walkers, lightsaber battles with Darth Maul’s brother and Boba Fett’s bonus skillshot. Zen Studios never fails to impress in any of their table designs bringing endless hours of addictive gameplay alongside visually impressive graphics. 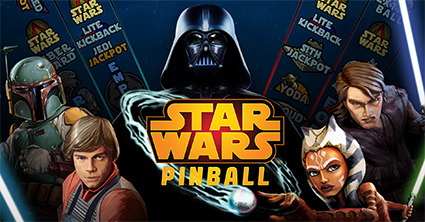 The Star Wars franchise will hopefully continue to dominate even in the world of Zen Pinball! Let’s hope for more tables real soon. The only downside is that you’re only getting the 3 tables for the price you would generally get for 4 tables judging on passed table packs but that shouldn’t be enough to put you off entirely. May the force be with you PINBALL WIZARDS!